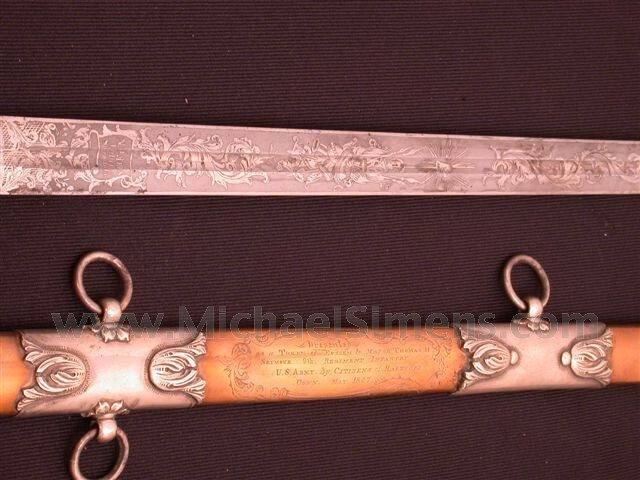 This Beautiful Ames High Grade Presentation style sword is one of the very elaborate and important presentations to a warrior returning from the War with Mexico with laurels. Tomas H. Seymour, a Congressman appointed commander of the 9th New England Regiment March of 1847 and by April was a Major of the 9th US Regiment and during the storming of Chapultepec in September assumed command as Lt. Colonel when Colonel Ransom was killed. He was made a Brevet Colonel for his action at Chapultepec and later a full Colonel of the US 12th Infantry. Thereafter he was elected as Governor of Connecticut and later still Minister to Russia. 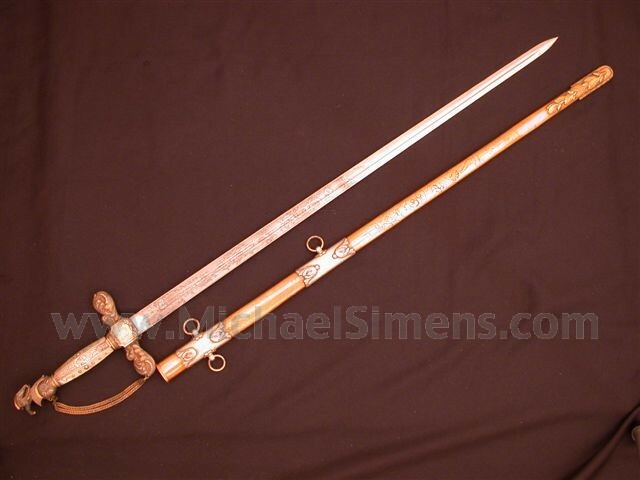 This Ames made sword has wonderfully engraved silver grip straps that alternate with Mother of Pearl strips that are further accented with small domed silver dots of varying sizes. The Knights helmet pommel is topped by an American Eagle, and the guard has two chains terminating on the cruciform style guard cast in a rich foliate. The double sided spear point blade is etched in a very high grade style. The Ames address is N.P. 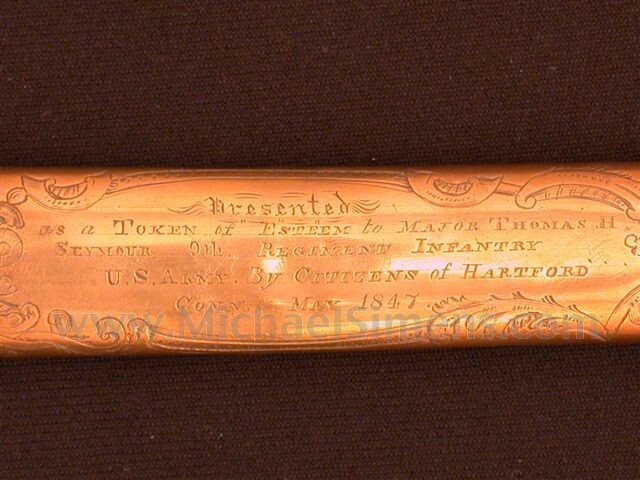 Ames / Cutler / Springfield, while the scabbard is engraved with a Cabotville address which is quite usual during this time frame. 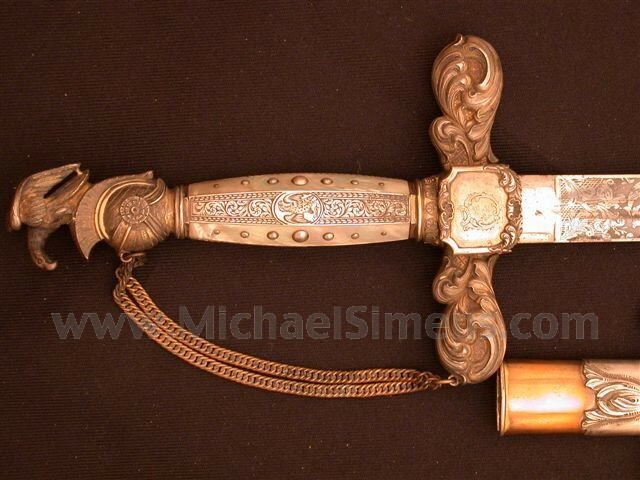 The brass scabbard is also gilt and the mounts are beautifully cast foliate pattern that are silver. The appearance of this sword is very handsome overall. It should find a place of honor in a major American arms collection. THIS SWORD IS FROM THE RICHARD JOHNSON COLLECTION WHICH HAS ITS OWN SECTION ON THIS WEBSITE. TO SEE THE ENTIRE COLLECTION, RETURN TO THE HOME PAGE AND CLICK ON THE GREEN, "RICHARD JOHNSON" ICON.